Hypnotherapy, The Truth About Hypnosis. Answers to the most common questions about the subconscious mind and more. Hypnotherapy, the ancient practice of healing and spiritual connection, shrouded in mystery. In its simplicity hypnotherapy is practice and faith. It is not a special food or drink or ritual. While science, psychology and philosophy are wonderful, necessary and hold a place in society, they are not hypnotherapy. Hypnotherapy is a separate focus, bringing together science, faith, trust and discipline. There is now SCIENTIFIC EVIDENCE that the way you think and feel can physiologically and biologically change your environment. This means by changing the way you think, and feel with hypnosis you can change your mind, brain, genetic expression, health, energy and life! This is amazing, measurable real change that everyone has the ability to experience. But it takes work, dedication and discipline to make change and hypnosis can help. Hypnotherapy is the practice of hypnosis which takes place in our own minds. The mysterious energies and powers associated with hypnosis is merely our own subconscious mind. We know where the subconscious is and how it functions and it is inside us, right here, right now, through our thinking. We can acquire the state of awareness of the subconscious mind at any time and use it without limit as it is a connection to a higher source, the universal mind in which we all are from. Hypnosis helps us to remove the lenses that blind us to our true self. With hypnosis you can re-write your story and discover new opportunities. What is the best definition of hypnosis? What is the difference between the mind and brain? Can hypnosis heal the body? What is the difference between conscious mind and subconscious mind? How is information accepted or rejected by the conscious mind? What is a therapeutic suggestion? How do people prevent themselves from going into hypnosis? Can a hypnotist force you to do things against your will? Has anyone ever been harmed by hypnosis? How do you let your subconscious mind take over? What is the critical factor? What happens to the mind under extreme stress? How does the subconscious mind communicate? How do you access the subconscious mind? Do hypnotherapists require a license to practice? What kind of training is required for Hypnotherapy? Hypnotherapy, for the discovery of our true nature. There is a common misconception of hypnosis as sleep, swinging pendulums and people doing absurd things out of their own control. Even those with advanced degrees and years of practice in psychology and medicine are unable to agree on a definition of hypnosis. Most people live with no sense of purpose, experiencing as if by chance, both good and evil. Yet, the awakened person with the knowledge and wisdom of hypnosis and the subconscious mind assumes the responsibility of living. The awakened one knows there is a universal consciousness, a God source flowing through him and it has made him for a purpose, on purpose and left him with free will to create life without limitations. Hypnotherapy opens a person’s thinking to greatness and awakens the constant expectation that a powerful source does honor his thoughts, feelings and emotions and does act upon them. Through hypnotherapy illnesses are healed, the scarcity thinkers are transformed into prosperous receivers, and the sad are made glad. Hypnosis is a way to directly connect to the subconscious mind to use internal resources for physical, mental and emotional improvement. It can help a person to instinctively solve problems, accomplish goals and push aside fear when it is not needed. Because hypnosis is natural and holistic, it acts upon the creative intelligence and imagination from within. In fact, hypnosis is so easy and effective that it can sometimes be difficult for the average logical adult to believe in its capabilities. Furthermore, hypnotherapy has been used for literally thousands of years and is starting once again to be recognized not only by science but by massive numbers of people throughout the world for its powerful, life changing abilities. hypnosis is a natural, altered state of mind, where the critical factor is bypassed and selective thinking is established. To make sense of this widely accepted definition of hypnosis, one must question, what is the altered state? Because the word “altered” can have many different meanings such as modified, amended, changed or made different, if we are to have an “altered state” then how many states do we as humans possess? How many changes can we make, and to what extent can we make these changes? Is there a light, medium and deep state? We simply do not know. Furthermore, who makes the change, the hypnotherapist or the person being hypnotized? If the state is changed and a person enters into a different level of consciousness, then what was the previous state of the person? As you can see even our accepted definition of hypnosis only leads to more questions that we yet have answers for. Therefore, the definition of hypnosis remains vague. Yet, experts in the field of hypnotherapy all agree that this definition of hypnosis is completely incorrect. Hypnosis in no way resembles sleep. In fact, a person becomes more focused, attuned and aware the longer they are in hypnosis. Many people believe that a person is sleeping during hypnosis because the person’s eyes are closed. Additionally, because the word “sleep” is so commonly used in the induction process, confusion continues. Because there are so many misconceptions around the word hypnosis, the best way to correctly define hypnosis is through the process of elimination. Never while in hypnosis is a person’s nervous system inactive, nor is their consciousness suspended. In hypnosis a person is fully conscious, never sleeping and has complete voluntary control. The definition of trance more describes a person who is under the influence of drugs or alcohol and the more drugs and alcohol are consumed the further the trance state a person enters. In hypnosis people have full and heightened awareness of their surroundings and have full ability to notice and respond to their environment. However, in order to fully understand the definition of hypnosis, we need to understand the mind, because the mind is where everything begins. The mind and the brain are completely separate and serve two distinct purposes. The brain takes order from a superior source, the subconscious mind. Each action the body makes, including those we are not consciously aware of like breathing, blinking and how blood flows through the body is the direct response from the subconscious mind. The subconscious mind is the source of all things tangible, touchable, and material. Everything stems from the subconscious mind and consciousness. All physical health, disease, inventions, behaviors and life in general comes first from the subconscious mind. Tapping into the subconscious mind means to tap into a person’s beliefs, feelings, memory, state of grace, love, universal consciousness and connection to spirit. These mental aspects all activate how the brain responds at a neurological and chemical level. This is how a thought becomes a thing. When comparing the brain and mind to a computer, the mind would be the program or software that tells the brain how to function. The brain would be the hardware that receives the programmed message from the mind and creates a physical outcome. Immaterial – Can’t physically see or touch. Can only feel. Material – Can see and touch. 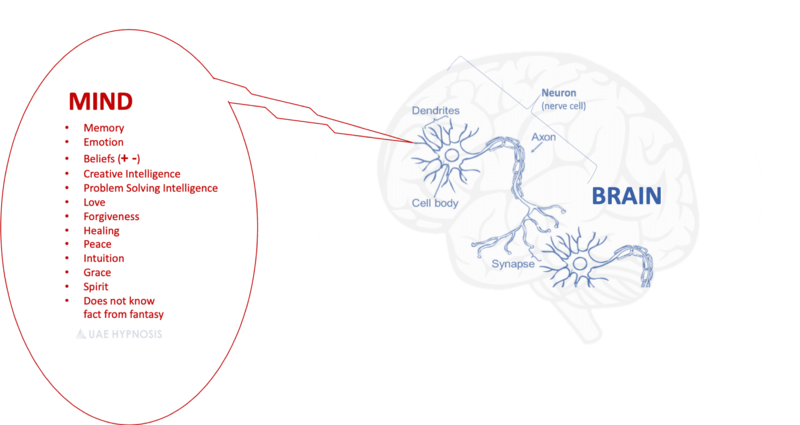 Synapse – Where Information from one nerve cell flows across to another nerve cell. The brain is the master control center for the entire body, every cell in the body is controlled by the brain. Neurons send and receive messages by means of electrical and chemical signals. Certain signals can make us rest and relax, while others can make us feel stressed and anxious. For the sake of simplicity, you can think of the brain like a baker and his bakery. The baker has many cakes in his bakery. He sells vanilla cakes and chocolate cakes. The baker needs a different recipe to bake all his different cakes. If the baker receives instructions for a chocolate cake, he will bake a chocolate cake. If the baker receives instructions for a vanilla cake, he will bake a vanilla cake. The baker and the bakery are the brain. The instructions and the recipe are the mind. Now, let’s pretend there is a woman named Sara. Sara is a 35-year-old woman who is driving in rush hour on her way to work. Suddenly, a familiar song comes on the radio. In an instant, she feels excited, connected and full of joy. It’s a song from her childhood and it stimulates a happy memory. She remembers singing in the living room with her mom and sister while preparing for her 5th birthday party. The childhood memory was imprinted in her subconscious mind 30 years ago. Hearing the song opened Sara’s mind to the subconscious memory and the energy around this memory sent a message to the hypothalamus in Sara’s brain to release the feel-good neurotransmitter, dopamine into her body. Now Sara drives to work feeling happy, with a smile on her face. The subconscious mind is the storeroom of all experiences and it is where the source of spirit, beliefs, emotion, memory, creativity and problem-solving intelligence reside. Our perception of the world also comes from the subconscious mind and the way we perceive a situation can have a direct physical, electrical and chemical effect on the brain. Hypnosis is a way to connect with the subconscious mind. Once communication has been made, there can be acceptance of an idea or suggestion without conscious intervention. Hypnotherapy uses hypnosis to guide a person into their subconscious state of awareness so they can do such things as recall events to remove certain symptoms they may be experiencing. While in hypnosis a person can deal with the cause of a symptom and remove the symptom completely. Hypnotherapy has a place in both the medical field and spiritual arena. It can be used to discover, heal, connect and create. To reset and rejuvenate the body. Learn self-control and how to make good choices. Connect with the subconscious mind to receive guidance from inner intelligence. Change negative patterns and ineffective beliefs. Replace unwanted habits with new effective patterns. Hypnosis works the same as the placebo effect and in essence they are the same thing, both using imagination to cause a person to expect and create a healing. Belief of healing leads to healing. The person is never treated by hypnosis but while in hypnosis. Hypnosis itself is not a cure, it allows a person to see his problems through new lenses, so he has the ability to meet his needs with new understandings, strategies and life skills. People who criticize hypnosis do not understand that the state of hypnosis is a mutual relationship between the hypnotherapist and client and involves actual client participation. By the time a person accepts treatment and is working with a hypnotherapist, they have already fully accepted their own need for the therapy which increases the receptiveness of the hypnotic process. With the full involvement of the client in a “ready for change” state of mind, suggestions are easily accepted into the subconscious mind and healing transformation can commence. The language of the subconscious mind is images, pictures and symbols and each person can visualize their life and become the architect of their desires. Every person is born with the creative intelligence to make mental images. Mental images are developments of the thoughts, needs and aspirations to be achieved. By introducing the thoughts, needs and aspirations to the subconscious mind a person can begin to see the circumstance and opportunities that need to be made, to materialize their desired outcome. Everything in the world is the result of the mind in action from a single thought. Thought comes first, followed by responsive action. Mind power is real, it is energy and it cannot be eliminated. People go throughout their day functioning without being consciously aware of what they are actually doing. We use our muscles to walk, hold our phones and drink our coffee, all while our lungs, stomach and other muscles and glands are working without any conscious effort. If we had to consciously think of everything we needed to do, to stay alive and interact in life, we would become overwhelmed. A person doesn’t normally think about every breath they take, how their heart beats or how their food is digesting. All these functions are happening at a subconscious level and we fully know, trust and believe the entire process. While in the state of hypnosis, all the bodily functions can be changed. With the use of hypnosis muscles can become stiff or loose; pain can be eliminated and generated; taste, hearing and speech can be changed and removed; fear, anxiety and other emotional issues can be modified or removed all together. A racing heart, shallow breathing, blushing and a sweaty body involved in a panic attack can be modified and anesthesia can be created so potentially harmful drugs can be avoided. It is reasonable to imply that if all the functions of the body can be modified through hypnosis, then whatever is responsible for the changes is also responsible for the body’s normal functioning. We know that the heart, lungs, stomach, kidneys, bladder and the rest of the human body functions without conscious effort. The body’s organs work when we sleep, and when under anesthesia for a surgery. The subconscious mind is the energy source for the brain, sending it detailed instructions or “suggestions” to perform very precise tasks. The purpose, then, of the subconscious mind is to regulate how the body functions, based on information it stores. While in hypnosis, new suggestions can be used to change how the body performs. This means that a hypnotherapist can give suggestions to a person while the person is in hypnosis to slow down their heart rate, and so it be. In hypnotherapy one of the major differences between the conscious mind and subconscious is that the conscious mind gathers and stores information from the senses like hearing and sight. This information is only stored if the conscious mind accepts it as believable, true and important. The greater the belief, the greater the manner in which the person carry’s out the information. Information in the conscious mind is either accepted or rejected. Stores information only if it is believable, true and important. All information presented to subconscious is accepted and stored for future use, unless the information or suggestion goes against the person’s morality or are not compatible with the needs and desires of the person. Information from the outside world is being analyzed by the conscious mind and passes through an immaterial filter called the critical factor before it is accepted or rejected. The critical factor compares information and stimuli coming from the conscious mind and outside world with beliefs and patterns already stored in the depths of the subconscious mind. If the information matches an already stored pattern and program, then the conscious mind accepts and stores it. However, when the information does not match, it is sent back to the conscious mind for further analysis where it is most likely to be rejected. What is the critical factor? In hypnosis, the critical factor filter is open and allows for suggestions to travel directly to the subconscious mind for automatic acceptance. When the critical factor is relaxed via hypnosis a person can accept new programs into their subconscious mind for such things as improved immune functioning. A therapeutic suggestion is a suggestion to the mind that causes action. It’s an instruction to your inner intelligence within your subconscious mind. Suggestion therapy is the process of saturating the conscious and subconscious mind with positive ideas and imagery. This creates new positive emotions, behavior patterns and results. Anyone has the ability to go into hypnosis and connect to their true nature. We are all born with this ability. However, people can prevent themselves from allowing this natural process to occur. Believe they are “strong willed” and that they can not go into hypnosis. They fear suppressed emotion of anger will emerge. A negative experience with hypnosis in the past. Lack of rapport with the hypnotherapist. “Forced” to “try” hypnosis by a friend or family member against their will. This is a negative payoff. Trying to hard to go into hypnosis. Does the subconscious mind use logic? The subconscious mind gathers and stores information for the brain to use. However, the subconscious does not analyze information as true, believable or important. The subconscious mind does not use logic, cannot analyze and cannot differentiate between reality and imagination. A good example proving the notion of the subconscious not being able to distinguish reality from imagination is the lemon test. When a person simply thinks of biting into a big, juicy, sour lemon, the brain releases chemicals to stimulate the salivary glands which creates saliva in the mouth. The real chemical stimulation occurs even with no real lemon, and the person was imagining the whole scenario. All suggestions, information and direction that is presented to the subconscious is automatically accepted unless it goes against the values and morals of the person. This is why a person would never do or say anything out of character in hypnosis. There is a misconception that the hypnotist can make the subject do anything. This is not true and there is no such thing as “mind control.” If the hypnotist asks his client a question that the client is uncomfortable answering, the client, completely aware of what is going on will not answer the question. If the hypnotist asks a person to bark like a dog, but the client does not want to, then the person won’t bark like a dog. When you see on television a person doing funny things in hypnosis on a stage or in a show, it’s simply because they want to. A hypnotized person will also never accept any suggestions from another person or even themselves during self-hypnosis, if the suggestion is not compatible with his needs and desires. Due to the law of self-preservation and how it prevails in the hypnotic state, a person will not allow himself to accept a harmful suggestion. Because of this no one has ever been injured by hypnosis. There has been thousands of tests conducted around the world to see if a person can be knowingly or unknowingly “fooled” or induced to harm himself or commit a crime. There is no case on record of any such result. In every case, the person being tested either rejected the negative suggestion or completely terminated the trance state himself. Hypnosis is a safe and effective tool for positive change. Does a person have control while in hypnosis? While in hypnosis, a person has complete control of all his faculties. A person can hear, see, feel, smell, taste and speak as normal. Because hypnosis takes focus, sometimes the senses may even be more heightened than normal. What does hypnosis do to the brain? The brain is the command center of the body and hypnosis, meditation, spirituality and prayer can alter the way the brain functions. There is a vast and profound range of possibilities concealed within us and with a single thought we can create greatness. The potential we possess as humans is magnificent and real it can be touched with the human hand and explored in the depths of dreams. Because the brain rules all the cells in the body, there must also be something that rules the brain. Then what is the energy, impulse and instruction sent to the brain giving it direction? Nothing is spontaneous, as everything is response to something else. The body responds in effect from intentional and unintentional conscious and subconscious thought. The subconscious mind is a feedback mechanism that instructs the brain into action. The instructions coming from the subconscious mind can be information stored from long in the past or from now in present time. Either way, stored information always transpires at specific times and events. The more the person believes in the information and the more important they consider it to be, the faster the brain responds to the message. The organs and glands in the body all respond to stimulus from the cortex of the brain. The stimulus is activated by the words and suggestions set forth by the hypnotist or authority delivering the message. All hypnosis is spiritual hypnosis. However, many practitioners stay away from the spiritual identity because it may mistakenly associate the practice of hypnotherapy with the esoteric, and occult practices. Also, many practitioners don’t have the in depth knowledge of religion and spirit and don’t feel confident in expressing this most important element of hypnotherapy into their practice. Colleagues of mine have expressed that they are too afraid to bring God into therapy because it may offend or turn away clients. They believe it’s much more productive to hold a practice based upon the ideals associated with western medicine. Many hypnotherapists today work with a small part of hypnosis known as the psychological model. The psychological model of hypnotherapy addresses the unconscious and conscious mind without ever acknowledging the most important component of practice, the connection with the Divine, our Higher-Self, God, Source, and Spirit. Many of the healings that have occurred in my practice occurred once the person reconnected with their true nature and Spirit. It doesn’t matter the goal or issue, may it be weight loss, grief, addiction, anxiety, sadness, pain, finding love. Whatever a person wants to achieve or overcome can happen once the person makes a connection to Spirit. The subconscious mind is the doorway to Spirit and facilitates communication to everything we need, want and desire. And we mustn’t discredit how hypnosis truly “works.” In all the divine writings, in all the religions of the world a single point is always made; that words, thoughts and beliefs are powerful enough to create something out of nothing. The Bible states that the entire physical universe is a product of the word of God, the thought of God. Moses said that the creative word is in our own mouth that we should know it and do it; and Jesus said if you believe it will be done unto you. Words truly are the most influential drugs. There is real power in the way words work upon the mind. When we refer to the subconscious state of awareness and its potential, we are dealing with something that cannot be seen or touched. The connection that comes from hypnosis is Spirit in form. During normal daily activity the conscious mind is in the prime position and the subconscious mind is running in the background, always working, recording, imprinting and alive. When conscious awareness loses its capacity to judge and analyze current events, something miraculous activates in our consciousness. As our conscious awareness fades, the subconscious raises like a balancing scale. The conscious, subconscious balancing act can occur in two ways. When a person is exposed to a traumatic or high stress event. Fight or flight syndrome in the sympathetic nervous system activates. A person either stands his ground and “fights” or they “surrender” their reasoning and authority. Involuntary hypnosis – If the situation is too overwhelming for the conscious mind, it will turn within and hand over body control and emotional behavior to the subconscious mind. Person knowingly initiates the transition process. These cells are known to be sensitive and reactive to light, color and movement. When a person closes his eyes, all 95.5 million cells become inactive. Thousands of optic nerves that transfer messages from the eyes to the visual cortex also stop operating. Therefore, when a person closes his eyes his conscious awareness is significantly reduced, focus can be redirected, and relaxation can take place. The more a person focuses on relaxing a specific area of their body, the deeper into hypnosis they can go. When the body is relaxed, the subconscious has established its position of authority and the conscious mind has reduced to a lower level where it no longer can gather and analyze information. Once the subconscious mind has taken position all information is either fully accepted or rejected. All information that is ever collected by the conscious mind is stored in the brain’s memory. However, only the “important” information that is deemed believable and true is used by the subconscious mind through response and emotion. Because the subconscious mind can not analyze or discriminate, it simply stores for future use the information that is necessary for survival. Once information is presented to the subconscious mind it is stored in the brains’ memory as absolute truth. Furthermore, as the language of hypnotherapy is that of the subconscious mind, the deeper a person goes into hypnosis, the quicker they are to accept and create a result. For example, while in hypnosis a person may be subject to the suggestion that their arm is too heavy to lift and the harder they try to lift their arm the heavier it becomes, which in effect makes it so the person is unable to lift their arm. In November of 2016, I treated a close friend of mine who was having difficulty getting pregnant. She was 36 at the time and in our hypnotherapy session together she revealed that during an annual ob–gyn checkup her doctor had informed her that she would never get pregnant due to her stressful lifestyle and aging body. Because this information came from an authority figure in a high stress situation, the critical factor was bypassed and the subconscious was the dominant mind. Therefore, the doctors’ message of infertility was immediately accepted and imprinted into her memory as absolute truth. Since becoming pregnant is a function controlled by the subconscious mind, the only message thereafter delivered to the brain was the inability to get pregnant. No conscious effort could eliminate that statement and allow her to get pregnant. Through hypnosis I regressed her back to that ob-gyn appointment and we discovered the statement of the doctor. Suggestions to diminish the damaging statement from the doctor were presented to her subconscious along with suggestions that she is fertile and healthy and that her body was made to create life. She restored her faith and conceived a child 2 months later. The subconscious mind at any depth of hypnosis is an open door to suggestion and information and the deeper a person goes into the hypnotic state the more accepting and responsive they are to the information presented. People in authority like doctors, teachers and parents need to be very aware of their words. The critical factor is the gatekeeper. Some compare it to a filtering mechanism between the conscious mind and the subconscious mind. The critical factor examines incoming ideas. It compares these ideas to past experiences and places a perception upon them. Anything you say “yes” to, or believe to be right, is filtered through the conscious mind and into the subconscious mind. There are billions of nerve cells called neurons in our brain. These cells when active are what control the rest of our body by releasing chemicals messages called neurotransmitters in little packages called vesicles. Neurotransmitters transmit messages from one neuron to the next until the message reaches an organ or gland. The message can be stimulating or inhibiting to the gland or organ. Between each neuron there is a gap called a synapse where the message in the vesicle passes. Each neuron has thousands of these synaptic connecting points and there are trillions of synapses in the brain passing along the messages and instructing the body to function in certain ways. The initial activation of the first neuro transmission in the brain comes from a thought in the subconscious mind. Thought is the activation of all things manifest. The thought is the message passed to the brain and then along to the body. The subconscious mind is what holds all the information of how the body is to function. Because the functioning messages of the body are held within the subconscious mind, the functions of the body can be modified with new messages directed to the subconscious mind. When under extreme stress, anxiety and other high emotional pressure the conscious mind starts to become less efficient and analysis can be hindered to the point of nonfunctional. At this point the critical factor filter loosens and the subconscious mind takes over and without applying logic for one’s best interest, begins to store the events, emotions and behaviors for future use. This is the big reason why we behave in ways we dislike. It is during high stress moments that we lose our ability to think logically and become imprinted with unwanted behavioral responses. You’ll read next that a high stress situation is another way to quickly and directly connect with the subconscious mind. Hypnosis inductions: One of the most common ways people access their subconscious mind is with the use of hypnosis in hypnotherapy. To go into hypnosis or self-hypnosis people use the directions from induction techniques to transfer awareness from the conscious to the subconscious.What is an induction: Full focused attention and elimination of outside stimuli to guide the transition from conscious awareness to subconscious awareness, to enter into a state of hypnosis.Often the instructions of an induction are to progressively relax the body from head to toe such as “your arms become loose and limp and lazy; your eyelids are becoming heavier with each easy breath that you take…” finally when the person’s eyes are closed they are able to block out stimuli and distraction from the outside world and he is able to fully focus his attention to his body and it’s functions that are controlled by the subconscious mind. The faster a person is able to focus on his body and its response to the induction, the faster he is able to go into hypnosis. With the person’s concentrated efforts, he is able to put himself into hypnosis with the guided help of the hypnotherapist. Here is more proof that hypnosis is not something that happens to a person. Hypnosis is a collaborative effort between the hypnotherapist and the person wanting to go into hypnosis. The person has to want the process to happen. A person will always voluntarily enter into the state of awareness dominated by the subconscious mind. Hypnosis cannot be forced against another’s will. High stress event: A person can instantly connect to the subconscious mind or the hypnotic state under high stress situations. This transition is made involuntarily as the conscious mind becomes non-functional and the subconscious mind steps in to take control of the situation. It does not matter if the process of transition is voluntary or involuntary all the impressions made at that moment are imprinted in the subconscious mind as the subconscious mind has no way to interpret and analyze the events taking place. Prayer: Prayer is a repetitive driving thought, within the subconscious mind, of the person praying. While in a focused state of awareness and with full unshakable belief, a prayer can become miracle and manifest. Meditation: Because meditation helps relax the conscious mind and critical factor, it can gently connect one to the subconscious mind where introspection and relaxation can take place. How successful one is with hypnosis depends upon 2 things. The extent of desire to achieve the goal. The complete belief in what is desired. Anyone can be hypnotized if they want to be hypnotized and hypnosis works only if the person has a full desire to achieve their goal, backed by a full belief in what is desired. For example, a person cannot lose weight with hypnosis simply because their spouse wishes for them to be healthier. Success with hypnosis occurs with commitment, determination and desire of the individual. Because the mind has the ability to redirect its thought and recreate itself, so does the individual. Just as the body can be stimulated to function in a certain way via drugs and chemicals, it can also be changed by a mental process. To oversee and maintain the functions of the trillions of cells in the human body is beyond the capacity of the conscious mind. However, science and research is now proving the subconscious mind exceeds all limitations of space and time. Hypnosis is simply a state of awareness in the subconscious mind and psychological images cause physiological changes to occur. The images we store inside our subconscious mind become the energetic force that instruct the body. Hence, our body and life become the product of our creative imagination. Hypnotherapy is a natural approach to therapy that utilizes a person’s existing internal resources to advance the achievement of important goals. Hypnotherapists work with functional people for behavioral change. Hypnotherapists do not work with people who have been diagnosed by a psychotherapist with a mental health disorder. Hypnotherapists do not diagnose the client. They assess their clients to validate the person does not have a mental health illness. For the client assessment hypnotherapists use assessment tools like the DSM-5, Diagnostic and Statistical Manual of Mental Disorders. Hypnotherapy is a rapid intervention system using the tools of hypnosis to increase and redesign a person’s sense of competency and capability. Through the trance state of hypnosis, a person is able to more quickly move toward realizing and achieving their goals. Hypnotherapy works with the deeper subconscious and superconscious level of the mind. Most often full recovery and goal achievement occurs in only 4-6 sessions. Conventional psychotherapy works from the perspective that most people have some form of psychological disorder which develops as part of an evolving effort to socialize an instinctive, forceful energy labeled as the “id” (Sigmund Freud’s theory.) The id’s intention is to satisfy essential urges, needs and desires for immediate gratification. A form of therapy known as “talk therapy” is composed of a neutral dialogue to identify and change negative thoughts and behaviors of the patient. Psychologists are qualified to diagnose and provide individual and group therapy for people with mental health disorders and illnesses. Psychiatrists can prescribe medications to help patients manage the effects of mental health disorders. Psychotherapists work with the superficial conscious mind. It typically takes 20-50 sessions for full recovery and about 12-20 sessions for partial recovery according to the studies presented in the Standard Handbook of Psychotherapy and Behavior Change, a collection of scientifically proven assessments on the effectiveness of psychotherapeutic practices. This can be found in the chapter “The efficacy and effectiveness of psychotherapy” Some therapists achieve better than average results, while other therapists’ results may take longer. Hypnotherapists work to help improve the moods, feelings, thoughts and behaviors of a person. Not every hypnotherapist is a licensed mental health care worker. Hypnotherapy is a vocational profession and does not require a license. Because mental health therapists work with people who have mental health illness and because their therapy has been labeled as “may cause harm”, they must obtain a license. Hypnotherapists do not require licensure because hypnotherapy and hypnosis cannot harm a person in any way. Hypnotherapists need to assure they assess their clients properly to validate they don’t have a mental health illness. For the client assessment both licensed mental health care therapists and hypnotherapists use assessment tools like the DSM-5, Diagnostic and Statistical Manual of Mental Disorders. Hypnotherapists require certified training from professionally licensed schools and teachers to rightfully practice hypnotherapy. Hypnotherapy training programs are approved by government regulated educational institutions like the U.S. Department of Education as a training of Health Sciences and Human Services. Licenses are only legally required for occupations that can potentially harm a person such as psychotherapy, massage therapy, chiropractic and other professional and medical professions. Many hypnotherapy boards overseeing the regulation of hypnotherapists and safety of the community require continuing education to maintain certification and registration. Certified hypnotherapists can have up to and over 500 hours of training in hypnotherapy as a new graduate. Many licensed health care workers may rely on their psychology training when practicing hypnotherapy and attend weekend long courses in hypnotherapy for continuing education, only about 8 – 20 hours of hypnotherapy education. Although this is not true for all mental health care practitioners it’s important to ask how much training has been completed. Because hypnotherapy and psychotherapy are completely different practices. If you are seeking hypnotherapy services, it is recommended to choose a hypnotherapist, licensed in mental health practices or not, who has at least 500 hours of reputable hypnotherapy training. We are born with unlimited potential, we are boundless, and we hold within us all possibilities of development and creativity. Hypnosis is not a thing of itself but a medium directing thoughts, behaviors, emotions and actions. It is a channel connecting us to knowledge, creative intelligence, health, energy and life. The subconscious mind is the internal doorway to which man can enter at any time to call upon whatever it is he needs or desires. The subconscious mind is infinite and is the eternal spirit. The intelligence of the subconscious mind is universal intelligence and is self-knowing. To understand hypnosis is to understand that the mind can be called upon for transformation, creation and advancement. Connecting with the subconscious mind purposefully is the key to significant mental and spiritual work. To know of hypnosis, hypnotherapy and the mind is not enough. We must use the knowledge of its workings to make conscious use of it for positive self-expression. The principle of hypnotherapy, and of all mind-body therapies, is an inner awareness of the presence of perfection within. It is the hope of something greater, the knowing and comfort of being fully connected. Within the infinite source we are connected to, is the potential of all our needs, desires and creative ideas. The discovery of our connection, and of our true self, is the greatest truth of man and is the greatest breakthrough in all time.